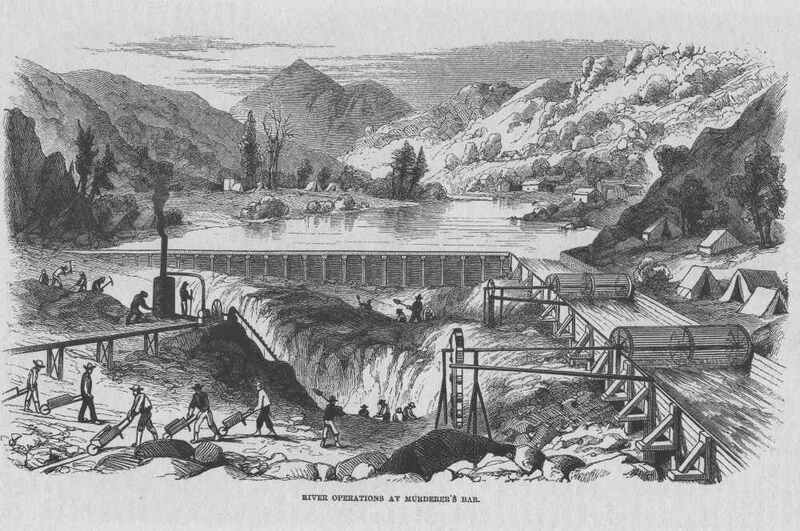 In 1848, just two weeks before California was officially designated a part of the United States in the Treaty of Guadalupe Hidalgo, James Marshall discovered gold along the American River in Coloma at Sutter Mill, between Sacramento and Lake Tahoe. Before long, 300,000 intrepid gold prospectors, mostly men, headed west in search of a fortune. It was one that was rarely found. Those who benefited most from the gold rush, other than the early miners already in the area when gold was first found, were the merchants who supplied the goods, fare, booze and entertainment to the men panning for ore. Towns popped up in the Sierra foothills overnight along what is now California State Route/Highway 49 (one such town, Downieville, was at one time a leading candidate to become the state's capital due to its location as a central hub during the gold boom). By 1855 the gold rush had ended, but not before sparking an aggressive push to take hold of the west and, in doing so, populating Northern California with people of American and European ancestry, as well as numerous Asian immigrants. Prior to the California Gold Rush, San Francisco was home to less than 1,000 people. Twenty years later it held 150,000. A visit to the heart of Gold Country today is a mix of history and nature. Comprising the northern and western foothill reaches of the Sierra Nevada along Highway 49, California's Gold Country is rich with wildlife, scenic rivers, glacially-carved lake basins, and, as the region's informal place name suggests, old mines, flumes, rails and mining towns betokening the initial mad rush and the long legacy of mineral extraction. Fall is an especially nice time to visit Gold Country, when the foliage is changing color and the summer's intense heat in this part of interior California gives way to a more pleasant ambiance. Located in the heart of California’s Mother Lode Country in modern day Grass Valley, Empire Mine State Historic Park preserves what was California’s longest standing and most productive gold mine. The core park grounds hold an interesting contrast. The grounds are split between the working mine yard and the elegant English manor-style mansion and gardens that were occupied by the influential owner William Bourn, Jr. The mine shaft at Empire Mine State Historic Park. Photo by Aron Bosworth. 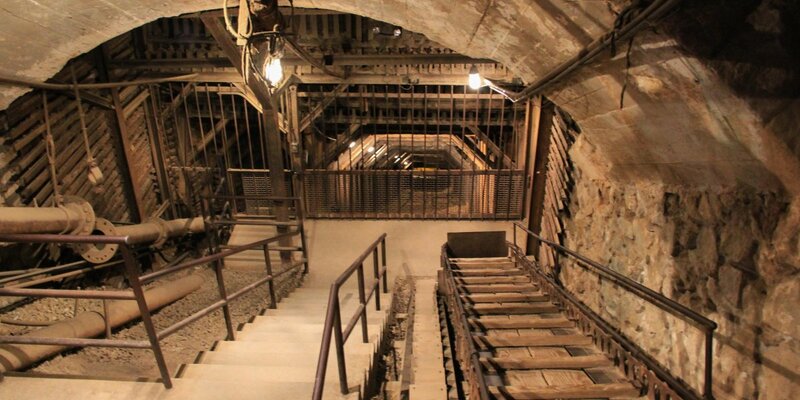 Visitors can explore the mine yard and even drop down 50 feet into the mine shaft entrance, which holds an astounding 367 miles of abandoned and flooded shafts/tunnels. The main shaft is said to extend 11,000 feet on an incline a mile below the surface. Tucked away in the Ponderosa laden Sierra foothills near Nevada City, Malakoff Diggins State Historic Park is home to remnants of what was once the world's largest hydraulic mining pit. Miners would literally blast the earth with water canons called monitors to unearth gold, a process which left atrocious environmental destruction in it's wake. 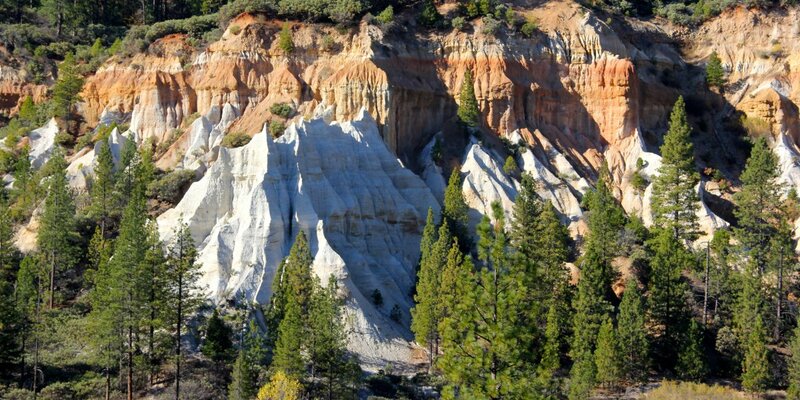 It also left an eroded mining pit called the "diggins" which is said to resemble a miniature Bryce Canyon. Today the mining pit and nearby historic town are open to visitors, affording a glimpse into this peculiar piece of California’s gold mining history. The "Diggins" at Malakoff Diggins State Historic Park. Photo by Aron Bosworth. South Yuba River State Park boasts a rich Gold Country heritage. The river was a focus for gold mining, and the spirit continues to live on through the park. Flume-lined hiking trails, historic covered bridges, and emerald clear waters are just some of the highlights. 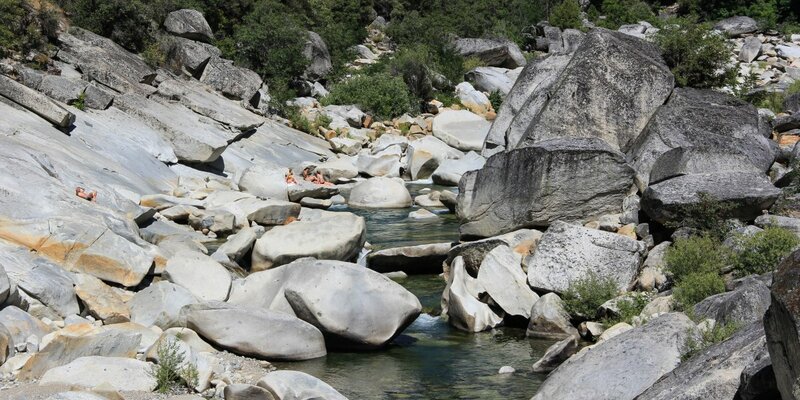 Sections of the river canyon, such as at Highway 49 Crossing, are lined with large granite boulders that form picture-perfect swimming holes surrounded by rock perches ideal for wasting a few weekend hours away. Be sure not to miss the historic Bridgeport Covered Bridge, which also provides river and swimming access. Swimmers relaxing at Highway 49 Crossing. Photo by Aron Bosworth. During fall the area cools down, and this is a great time for hiking in the park. The weather makes the trails pleasant, and visitors have hiking options ranging from easy to strenuous. Scenic hiking trails include the Point Defiance Loop Trail and the old flume converted Independence Trail. 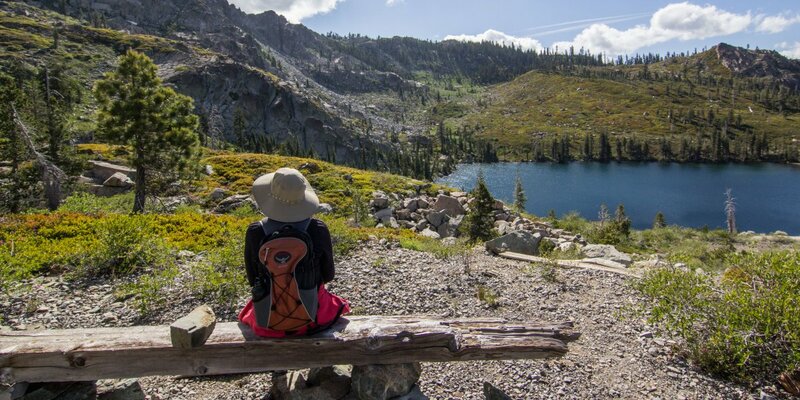 Beyond insanely beautiful scenery filled with alpine lakes and forested mountain backdrops, Lakes Basin Recreation Area holds a slice of California's Gold Country that is often overlooked. The area lies just to the north of Sierra City and the North Fork Yuba River, and if you can get up here before the snow falls, you'll find empty trails weaving around picturesque lakes and exploring old gold mine sites. The Bear Lakes Loop via Round Lake and Rock + Jamison Lakes Trails are great places to start. Remnants of abandoned gold stamp mills and mining artifacts are abundant. Vista over Round Lake near Round Lake Gold Mine. Photo by Aron Bosworth. Other Gold Country points of interest near Lakes Basin include Plumas-Eureka State Park and the Kentucky Mine Historic Park in Sierra City. Note: the following lodging/campgrounds are seasonal and typically close at the end of October. National forest campgrounds, however, may still be accessible when snow free. Herrington's Sierra Pines Resort offers a cozy mountain retreat set within this northern Sierra enclave, near the Pacific Crest Trail/Highway 49 junction. The seasonal resort is open from May through October, catering to anglers, families, and outdoorsy folks looking for reasonably priced lodging within a short drive of the Lakes Basin area. Herrington’s property offers unfettered access to nature, including a scenic stretch and direct access to the North Fork of the Yuba River, where good trout fishing abounds. Wild Plum Campground is open end of May through October and offers fishing access directly on Haypress Creek and additional opportunities just a short walk away on the more productive North Fork Yuba River. The Lakes Basin region of the northern Sierra is a short drive up Highway 49 and the Golden Lake Highway, which makes Wild Plum a great base for exploring the granite and lake-dotted region. Sardine Lake Campground is open June through October and offers camping access to one of the prettiest lakes in the Lakes Basin area, Lower Sardine Lake. Both the lake and the campground are popular with fisherman who come to fish the trout-rich waters that lie below the scenery of Sierra Buttes. Beyond the fishing access, Sardine Lakes Campground is ideally located for exploring various trails, mountaintops, and the many lakes of scenic Lakes Basin. It's a true mix of history and nature with recreational opportunities abounding.